Governor Morris (George Clooney) delivers a major speech at Kent State University in Columbia Pictures' IDES OF MARCH. The Golden Globes sprinkled a few upstarts among old favorites and went big-time retro by making its most nominated choice a silent film in nominations announced this morning. "The Artist," the black and white French silent film starring Jean Dujardin and Berenice Bejo, made the bigest splash with six nominations, including best comedy or musical. It will be up against George Clooney's "The Descendants," Martin Scorsese's "Hugo" and the Civil Rights-era dramedy "The Help" in the awards sweepstakes Jan. 15. 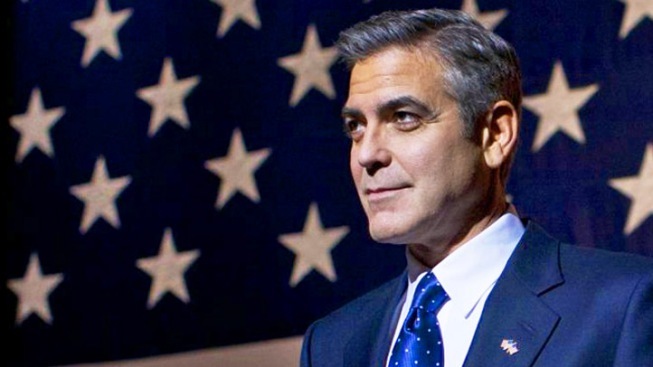 Stalwarts Clooney and Leonardo DiCaprio ("J. Edgar") heard their names called for best actor awards, with Clooney also scoring a screenplay nomination for "Ides of March." TV favorites "Glee," "Modern Family" and "30 Rock" fared well yet again. But new faces at next month's awards show at the Beverly Hilton in LA will include the extremely busy Jessica Chastain and Michael Fassbender, who joined Clooney and DiCaprio with a "best actor" nod for "Shame." The Best Picture, Drama nominees included the critically acclaimed "The Help," which also netted best supporting actress nods for both Chastain and Octavia Spencer," "The Descendants," "Hugo," "The Ides of March" and "Moneyball." The top comedy nominations included "50/50," which also earned a best comic actor nod for Joseph Gordon-Levitt, "Bridesmaids," "The Artist" and Woody Allen's "Midnight in Paris." Among some of the more critically-hyped films of the year, "The "Girl with the Dragon Tattoo" won nominations for Rooney Mara (best actress) and Trent Reznor (best score). "Tinker, Tailor, Soldier, Spy" the thriller based on the John LeCarre novel which stars Gary Oldman, was shut out. "Glee" and "Modern Family" were among the picks for best TV comedies, but were joined by "Enlightened," "Episodes" and "New Girl." Perennial favorite "30 Rock" saw stars Alec Baldwin and Tina Fey both nominated for best performance in a TV musical or comedy; their NBC stablemate Amy Poehler picked up a nod for starring in "Parks and Recreation." Laura Dern, ("Enlightened") and Zooey Deschanel ("New Girl") joined Fey and Poehler with individual nominations for their roles. Amog the male TV actors, Steve Buscemi ("Boardwalk Empire"), Bryan Cranston ("Breaking Bad"), Kelsey Grammar ("Boss") and Jeremy Irons ("The Borges") won best actor in a TV drama nominations.